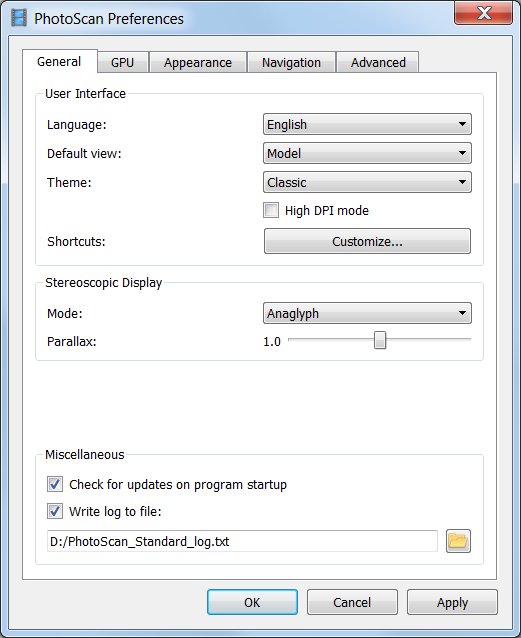 Open PhotoScan Preferences dialog from Tools menu using corresponding command. Check on any GPU devices detected by PhotoScan PhotoScan supports the following GPUs: CUDA enabled devices with compute capability 2.0 and higher or OpenCL 1.1 and higher enabled devices, for more information please refer to User Manual. 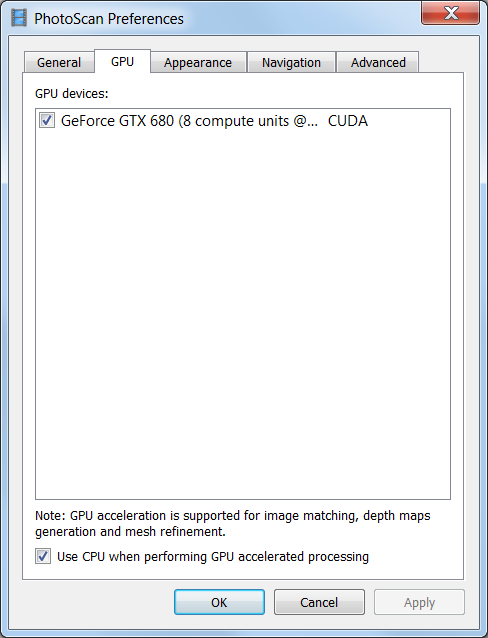 Use CPU when performing GPU accelerated processing: enabled when only one GPU device is detected. Use CPU when performing GPU accelerated processing: disabled when two or more GPU devices are detected, as using CPU in this case could slow down processing significantly. To add photos select the Add Photos... command from Workflow menu or click Add Photos button on Workspace toolbar. 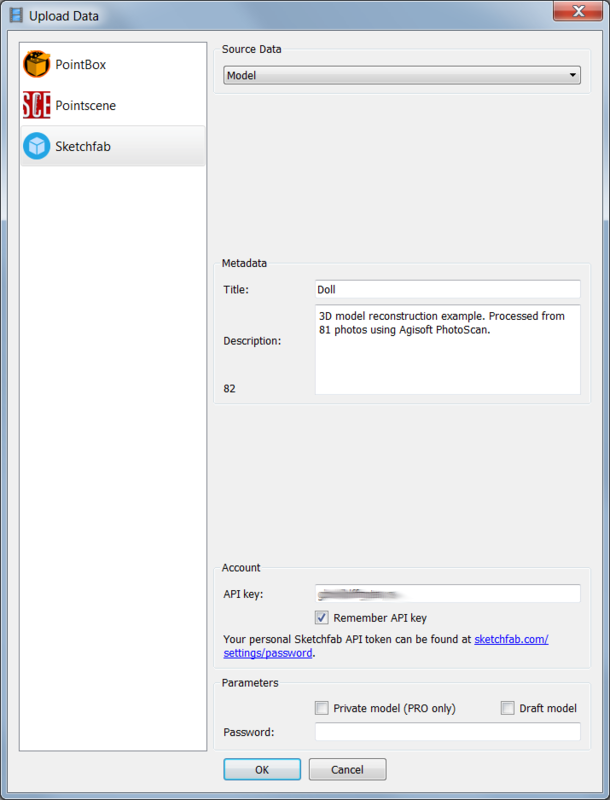 In the Add Photos dialog browse the source folder and select files to be processed. Click Open button. To achieve good reconstruction results it is necessary to mask all irrelevant elements on the source photos (background, turntable, accidental foreground, etc.). Open a photo with an irrelevant element in Photo View double-clicking on the photo in the Photo pane. Choose one of the selection tools from the downfolding list on the Toolbar: Rectangular Selection for rectangular shape irrelevant elements; Intelligent Scissors – to select irregular shaped area in the photo; Intelligent Paint – to paint the selection with the mouse. To mask uniform background of the image use Magic Wand tool. First, click the Magic Wand button on the Toolbar, then click inside the uniform area to be masked. To change the border of the automatically selected area, click inside the area to be added to the selection. Save the mask clicking Add Selection button from the Toolbar. To alter the current mask use other selection tools together with Add Selection / Substract Selection buttons on the Toolbar. 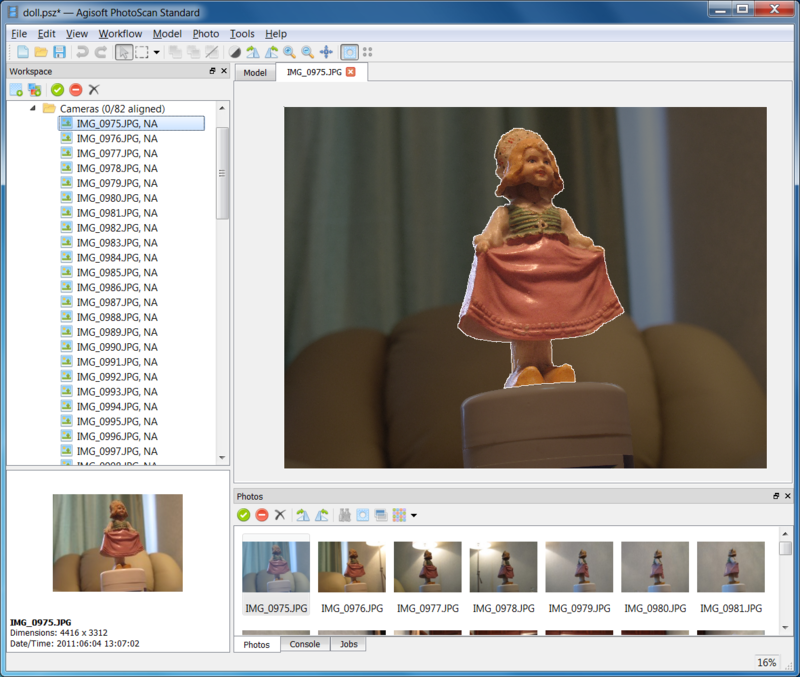 Repeat the described procedure for every photo where background (irrelevant elements) should be masked. Masked areas could be ignored at Align Photos processing stage (check Constrain features by mask option in Align Photos dialog) and are always ignored at Build Dense Cloud and Build Texture stages. 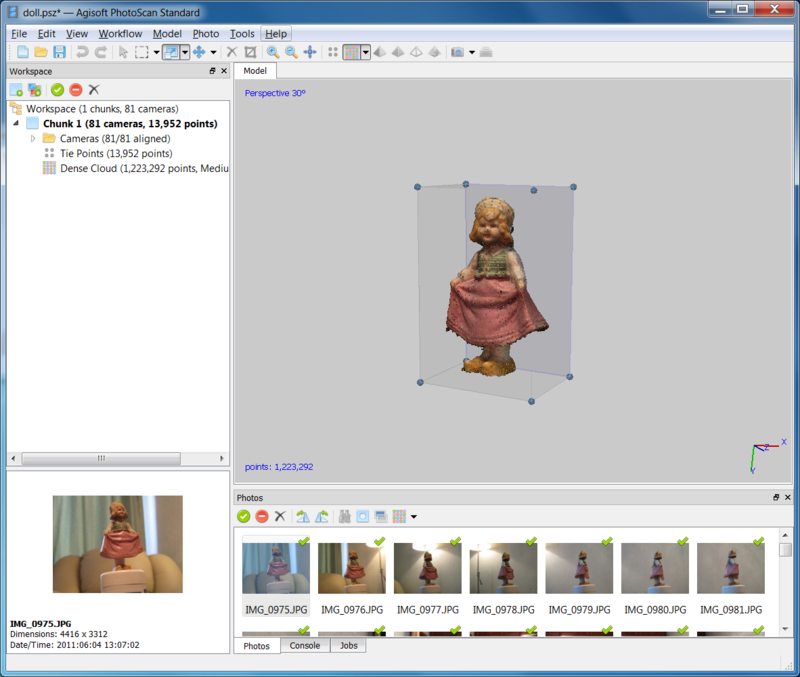 At this stage PhotoScan refines the camera position for each photo and builds the sparse point cloud model. 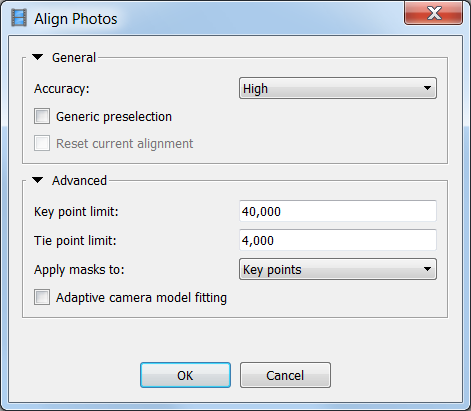 Select Align Photos command from the Workflow menu. Click OK button to start photo alignment. After photo alignment is finished, refine bounding box position and orientation to fit the object, as it defines the limits of reconstruction area. Bounding box is resizable and rotatable with the help of Resize Region and Rotate Region tools. This step is optional since PhotoScan automatically calculates bounding box dimensions and location. But it is recommended to check if any correction is needed, because geometry reconstruction step deals only with the point cloud inside the volume. Based on the estimated camera positions the program calculates depth information for each camera to be combined into a single dense point cloud. 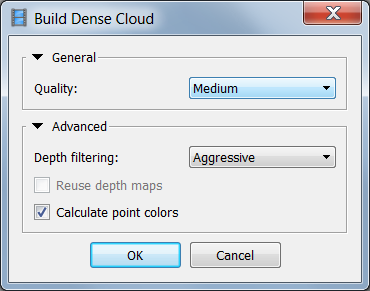 Select Build Dense Cloud command from the Workflow menu. 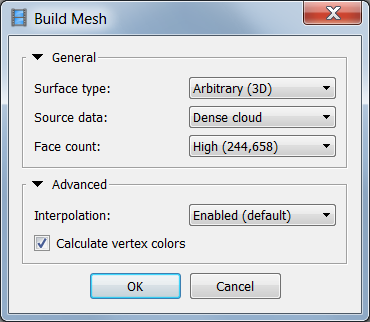 Click OK button to start building dense point cloud. Points from the dense cloud can be removed with the help of selection tools and Delete/Crop instruments located on the Toolbar. After dense point cloud has been reconstructed it is possible to generate polygonal mesh model based on the dense cloud data. 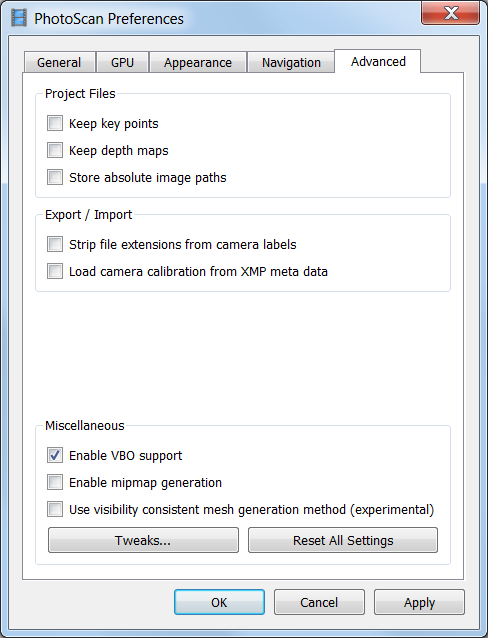 Select Build Mesh command from the Workflow menu. Click OK button to start mesh reconstruction. This step could be skipped if untextured model is sufficient as the final result. 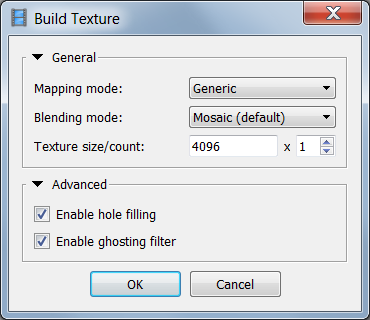 Select Build Texture command from the Workflow menu. Click OK button to start texture generation. 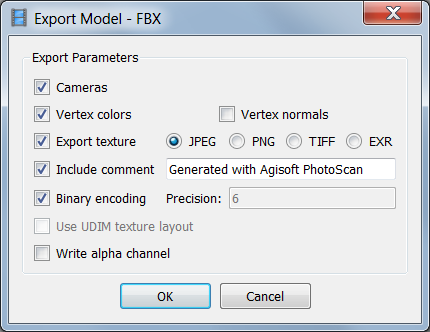 In case the model should be exported to the file, select Export Model... command from the File menu. In the Save As... dialog select the folder for the model to be saved in, print in the file name and choose preferred file type from the list. Click Save button. In the Export Model dialog indicate the desired export parameters. Note that the list of available exporting parameters depends on the selected file format. Note: Exported texture will be stored in the same folder as the 3D-model with the same file name (file type is selected by user). 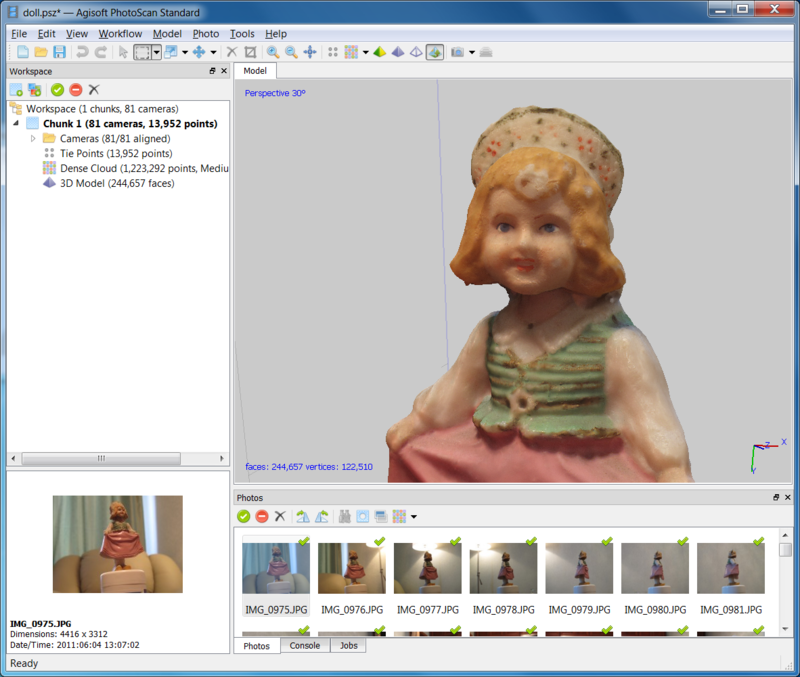 PhotoScan supports direct model and point cloud (both dense and sparse) upload to Sketchfab, Pointscene and PointBox resources. To publish your model online use Upload Data... command from the File menu. Note: To apply correct model orientation in space use Rotate Object tool prior to model upload.